Thank you Natick Comets, Boston Jr. Eagles, and Big Dogs! | GirlsEishockey.de e.V. Thank you Natick Comets, Boston Jr. Eagles, and Big Dogs! This wasn’t planned. Nina was 6 years old when we moved to Boston in 2009. She had started to learn to skate already in Germany in the years before. So we thought it would be a good idea to continue this effort. Maybe she could play some hockey some day. Just a bit, once a week, or every other week. Let’s try it. We bought used equipment (you never know if your kids really like it…). She started in the Natick Comets skills program which is designed to prepare kids for the „real“ hockey. I remember telling the coach in the first session that Nina does not understand English, but nobody cared and it didn’t matter at all. She moved quite quickly through the different skills levels. After some weeks we were surprised to hear that the Comets program offered not only skills twice a week, but also a house league for girls and boys who are not (yet) on a travel team. Well, again we thought, let’s try it. It was fun. They played 3 on 3 on small area fields. We heard other parents cheering „Great hustle, Nina!“. 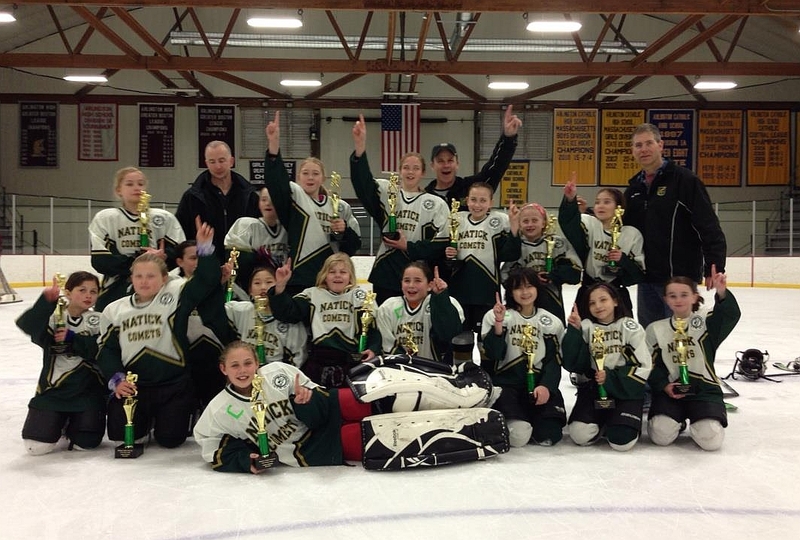 The U-10 Walpole Express defeated the Natick Comets in a shootout after 5 overtimes to win the 2013 William L. Chase Tournament. At the end of the first season, we were told we should sign-up for „Try-Outs“ for the travel team. After we understood the concept, we faced the question to try out for a mite team (boys 8 and under), or a U10 girls team (Later, in 2014 the organization even started a U8 girls team). Well, we thought, let’s try it and let Nina try out for the girls U10 team. She made it into the team and it was the first of four years of playing with the U10 team. Because of the age difference, the other girls were big at the beginning, but there was always a way to make it through. 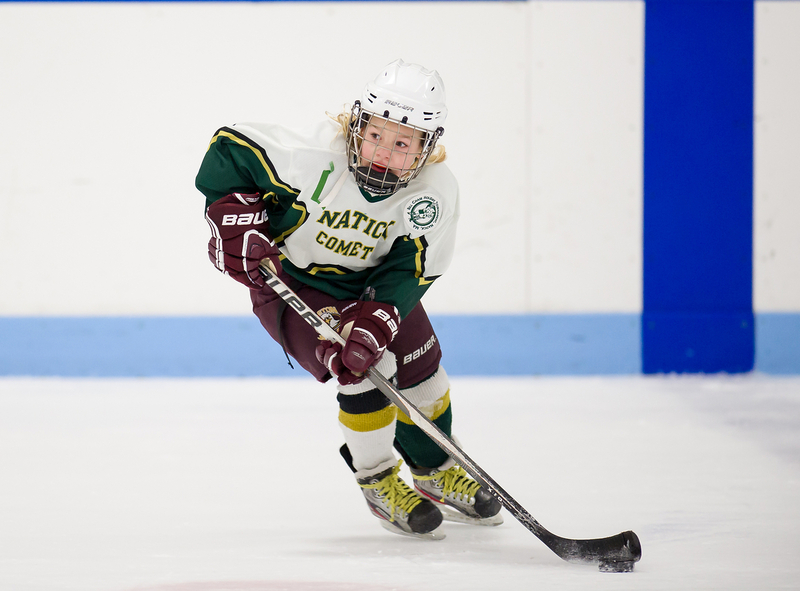 After four years of playing for the Natick Comets U10 team, she was recognized with the Bobby Orr award, the highest award of Natick Comets youth hockey organization. 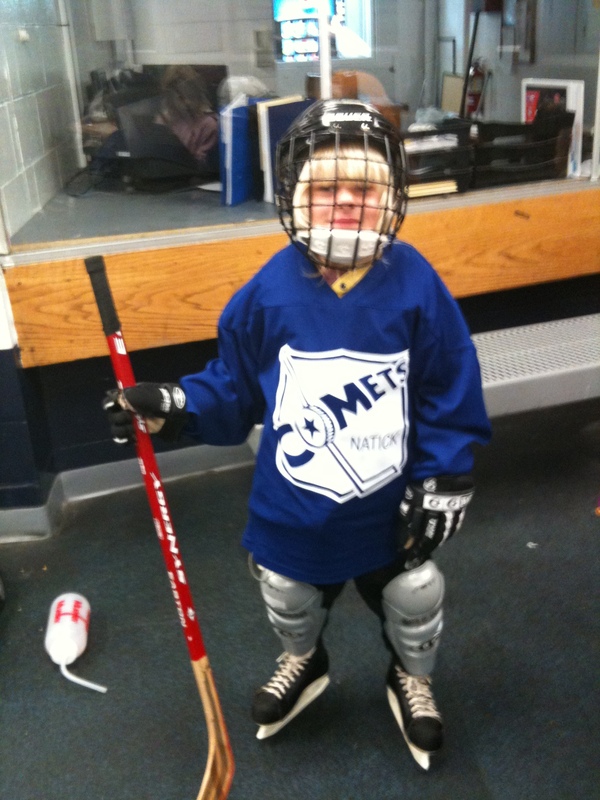 In the second U10 year a girl was on the Comets team who played not only for the „town“ team, but also for a „club“ team. What a surprise! Can you really play with two teams? Yes, you can! (Well, later we learned that some girls even play three teams: town team, club team, and middle school team). As Nina liked hockey and I became more and more proud watching my daughter play hockey, we tried out for club teams as well. After the first try-out session, the Boston Junior Eagles offered her a spot on the team. From that year we didn’t need to worry about weekend plans anymore, because the weekends were filled up with 1 to 3 games. Because of the density of girls hockey teams in the Boston area (there are more than 200 girls teams at U8-U14 levels), traveling to a game took not more than 30-60 minutes. In addition to the 20-30 regular season games, we loved the tournaments. Thanksgiving, Chase Tournament, and State Tournaments. You don’t need to watch NHL hockey if your daughter plays in playoff games with 3 or more overtimes. In one year, both her town team and her club team participated in Thanksgiving tournaments. While the turkey was in the oven, we traveled back and forth between 9 games. I can’t imagine anything more fun than hanging out with a group of awesome parents and girls during a tournament weekend in the same hotel and watch the girls play some fabulous hockey and between the games have fun in and around the hotel pool. Unforgettable also the Massachusetts states tournaments: If you play on two teams, you can even play in two state tournaments (Tier I and Tier III)! In 2013, the Comets U10 team were the runners-up after a 5 OT win in the semi-finals, and in 2014 Nina’s U10 Jr Eagles team proceeded to the championship game also after a 5 OT semi-finals win. Hockey in North America is a year round sports. Different from Europe, most US rinks are open in summer as well. The icing on the hockey cake is to play in summer tournaments. And setting up a summer team does not need more than some enthusiastic parents. Nina was asked in 2014 if she wanted play for the Big Dogs girls hockey team, a pick of better players from the top teams in the New England Girls Hockey League. The goal of the program is to provide girls with the ability to compete at very high levels of girls youth hockey, introduce the girls to more kids just like them and leave the girls wanting more. Of course, Nina wanted more! We wanted more! 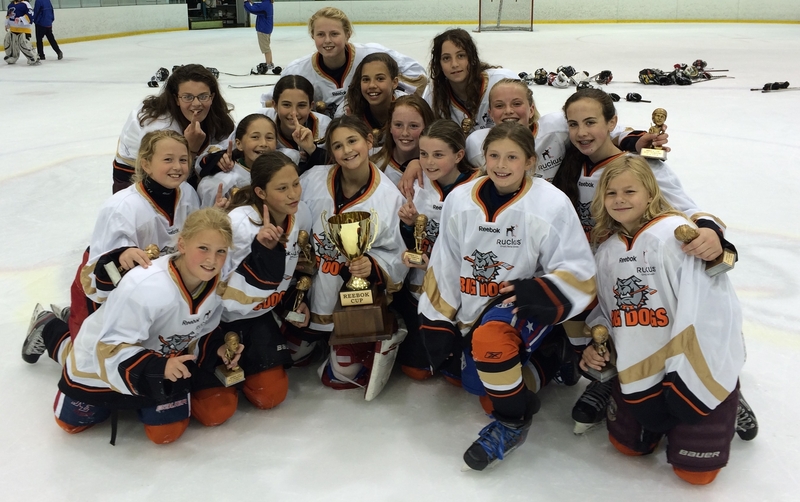 The Big Dogs 03 team (with all girls born in 2003) won the Reebock Cup in New Hamphire in 2014, and competed in tournaments in Montreal, New Hampshire and Rochester, NY in 2015. What do we take away from living 6 years in Boston? Most important: Girls love to play hockey. They love to have fun, and they love to hang and play with other girls. I believe that German girls deserve as well to have the choice to play hockey with other girls. They would love it. Thinking once again: Let’s try it. Let’s bring girls hockey to Germany! This is the purpose of GirlsEishockey.de. Nina, I can’t express to you how much the McDonald family is going to miss you and your family. You are one of the greatest, most generous girls we have ever met. Aside from being the best hockey player, more importantly you are an unbelievable individual. You taught both Mac and Jack the value of a true hockey player, how to play with strength, aggressiveness, determination, skill and a love of the game. Words can not say how much we love you and how great a loss it is to us to have you leave. We only wish you the best and can not wait to follow your hockey career and to be able to say, „We KNOW her, she is our friend! !“ Lots of Love and Happiness to you and your family!! Nina, It has been so wonderful to see you grow as a hockey player and a person through the years. We wish you the best of luck. We hope you are able to have an influence on girls‘ hockey in Germany! Nina: You have never stopped moving since we’ve known you! I know that Ali and our whole family will miss watching you play hockey and certainly will remember what a great teammate (and challenging opponent!) you have been over the years. The German national team will be lucky to have you and we hope to see you in the years ahead, whether in a tournament or in the Olympics. We wish you many years of success, and more importantly, happiness, and hope you remember these years in Massachusetts fondly. You are a true leader and I’m sure will be successful at whatever you decide to do. Your family will be missed. Good luck! You bring fun, laughter, and enthusiasm with you every where you go. We will miss seeing your beautiful smile and joyous laughter at the rink. But we know that you will be blessing others with your beautiful spirit when you return to Germany. Teach those girls some hockey moves, too! Nina, It was wonderful to see you become such a great hockey player and sharing this past hockey season with. While we only had one season with you, your spirit and enthusiasm will be remembered for a long time. I hope you can bring the same laughter and joy to Germany and inspire the girls around you. You certainly impacted all the girls here in such a positive light! We wish you all the best! I am so happy I had the chance to be one of your coaches over the past few years. Caitlin had a great time playing on your teams. I will always remember our little chats by the door between shifts while you were waiting to go out on the ice. You would me laugh all the time and made being a coach so much fun. I’m glad Caitlin got the chance to play with you. I can’t wait to see what the future holds for you in the hockey world and beyond. You are bound for greatness!! Looking forward to hearing about the adventures of Nina! Thank you for entertaining Nina’s desire to play hockey. From the age of 6 when she first took to the ice I have had the pleasure of watching her play, and coaching her. From the first day of watching her you could see how much she loved the game. Her full speed approach to the game has influenced her teammates and coaches, and proven that the equipment worn to protect players functions perfectly. U.S. hockey’s loss will be Germany’s gain. My daughter is very disappointed that she will not have the opportunity to play with Nina in the near future. Nina’s spirited play has improved Massachusetts hockey and other players who played or opposed her. Hockey is the greatest sport in the world. I hope you can show the German community how great it is for girls. The confidence, friendships, and competitive fire it brings cannot be matched. You know the expression „Worth the price of admission“? I was lucky enough to be Nina’s coach for a few seasons and can honestly say that nobody can inspire their team and create excitement in the arena like she can. And most importantly, hockey aside, what a great kid! Remember the time you ghosted us on Halloween? Too funny! We will miss you Christof family, and there is no doubt in my mind that you will succeed in bringing girls hockey to Germany! Nina, best of luck to you as you return to Germany. We will miss watching you play…but we know one day we will see you playing at a much higher level on television. (Our guess is the Olympics!!). You have proven that given an opportunity, the desire and the proper teaching, any girl just starting to skate can become one of the best hockey players in the state. Girls just need the chance to play! We hope more than anything that you will continue to have the chance to play in a girls‘ hockey program in Germany. Girls in Germany need to experience what girls in America do: that playing with other girls in a competitive environment not only makes them better players, it makes them better people. Girls who play hockey learn skills that they will carry with them for not only the rest of their sports career but for the rest of their lives: assertiveness, confidence, critical on the spot thinking, and, most importantly, learning to work with a group of people. With the determination you and your family have, we don’t doubt that you will soon have a girls program in Germany! Best of luck to you all! Nina, we are going to miss you sooo much! From the U12 team, to countless hours in the backyard hockey rink, to playing soccer for us, and going snowboarding together, you have been such an amazing and great friend. We have become great friends in less than a full year! You helped to make me the goalie that I am today and I thank you. You taught me how to take a slap shot (which I tried to use in one game and failed miserably), wrist shot, and have better accuracy, as well as toughness from just playing with you, and how to hold my ground on the ice. I have become a better skater and goalie from just hanging out with you in my backyard! You are an amazing athlete and I hope to see you when you go to the Olympics to play for Germany! You probably are the most easy going person that I know, and that is a good thing because you were able to put up with me and my family. 🙂 I have only known you for about 10 months but we will miss you so much at Wilson (I can’t believe that he bought that). Anyway, good luck in Germany Nina, I hope to be at the Olympics in Beijing or Almaty cheering you on in 2022. You all will be missed so much and if you decide to come and visit, you will always have a place to stay.